Bertram John Membury, known as Bert, was born in Yeovil in 1883. He was the eldest of the six children of hairdresser and 'fancy' shop owner John Membury (1861-1926) and Elizabeth 'Bessie' née Committy (1859-1929). John and Bessie's children were; Bert, Archibald Ralph, known as Ralph (1886-1892), Graham (1894-1960), Gladys Muriel (1895-1976), Doris Marian (1899-1981) and Nora (1902-1945). In the 1891 census the family were living above John's shop premises at 100 Middle Street. By 1911 Bert was a tobacconist's manager and boarding at 13 Charlotte Street, Bath. He is known to have then moved to London where he worked as a buyer for Selfridge's department store. Bert enlisted in London, although the date is unknown. He was initially in the London Regiment (Artist's Rifles and Civil Service Rifles are both mentioned). His Service Number was 5157. However, Bert appears to have been transferred to the 10th Battalion, Royal Dublin Fusiliers. The 10th Battalion was formed in Dublin on 11 February 1916 and February and March were dedicated to gathering recruits and it is probable that Bert joined them at this time. In April 1916 the new battalion was training in Dublin Royal barracks when the 'Easter Rising' broke out. The 10th Battalion were involved in the relief of Dublin Castle. For the next three months the training continued in Ireland before the battalion left Ireland for Pirbright Camp on 5 August 1916. From here they moved on to France, landing at Le Havre on 19 August 1916. September was spent training in the trenches and experiencing the front line. In October 1916 six days were spent in the front line but most of the month was spent 'on fatigues' shifting supplies and ammunition. During November 1916 the 10th Battalion fought in the Battle of the Ancre from 13 to 18 November 1916. This was the final large British attack of the Battle of the Somme in 1916. It involved an attack on the German front line as it crossed the Ancre River, a sector of the front that had first been attacked by the British, including the 11th Border Regiment, on the first day of the Battle of the Somme without success. This was a strong sector of the German front. The first British objective involved an advance of 800 yards and would require the capture of at least three lines of trenches. The next target was the German second line, from Serre south to the Ancre. Finally it was hoped to capture Beaucourt, on the Ancre. All the early successes on the Ancre achieved was the creation of a British held salient on the Ancre, which proved to be a very dangerous area to be posted over the winter of 1916-17. During the Battle of the Ancre the 10th battalion had 50% casualties. Of the 493 officers and men starting out on the Ancre attack, 242 were recorded as killed, wounded or missing. During December 1916 and into January 1917, after the heavy casualties of the Ancre, the battalion regrouped and trained new arrivals well away from the line at Noyelles sur Mer. On 13 January 1917 they left their training camp at Noyelles sur Mer and marched back to the line, entering Beaucourt Support Line on 27 January 1917. During January-February 1917 the battalion had two periods in the line, one of nine days when they suffered the 'normal' casualties of front line life from snipers and artillery - 24 killed and 57 wounded. Then a further stint of six days during which the Germans withdrew from Miraumont, and the 10th Battalion advanced against a fighting withdrawal by the Germans. The month of March 1907 was spent training out of the line. Two long spells of training, one at Cabstand Huts for seventeen days then a seven-day march to get to La Perriere for the last five days of the month. They continued training at La Perriere until 8 April, before marching back to the line, entering the trenches on 14 April at Balleul Gavrelle Sector. The rest of the month was in the trenches, mainly the support trenches, though there was an attack on the village of Gavrelle without any artillery preparation. Owing to the very heavy German artillery and machine gun fire, the attempt was unsuccessful. Roughly one third of May 1917 was spent training at Ecurie, one third training at Ecoivres and one third in the line at Oppy-Gavrelle Sector with 16 killed and 23 wounded. The first three weeks of June 1917 were spent in camps around St Catherine, just back from the line. The battalion was involved both in training and in digging a new communications trench that had to be urgently finished to enable a big attack to take place. News then came through that the battalion was to leave the 63rd Naval Division and on 22 June left for Nooropeene and the 16th Division, where they formed part of the 48th Infantry Brigade. The battalion endured life in the trenches for the remainder of 1917 and remained with 48 Infantry Brigade, 16th (Irish) Division until 13 February 1918. It disbanded two days later, with about half the men going to form the 19th Entrenching Battalion, one quarter to 1st Battalion, Royal Dublin Fusiliers and one quarter to 2nd Battalion, Royal Dublin Fusiliers. The Entrenching Battalion was involved in constructing light railways to supply the trenches. During March 1918, when the German attack, Operation Michael, started on 21 March 1918, they moved up to the front to man the line, and were involved in the fighting through the retreat to Amiens over the next two weeks. On the second day of Operation Michael, Bert was reported missing. He was declared dead on 27 March 1918. He was 37 years old. The Western Gazette, in its edition of 17 May 1918, reported "Private Bert Membury, Civil Service Rifles, attached Dublin Fusiliers, has been missing since March 22nd and enquiries made through the usual channels have so far failed to trace him, though it is hoped he is a prisoner. Private Membury is the eldest son of Mr and Mrs J Membury of Middle Street, and, before joining the Artists’ Rifles, was a buyer at Selfridge’s, Oxford Street, London." In its edition of 22 November 1918 the Western Gazette further reported "Mr and Mrs J Membury, of Middle Street, have now received information which leaves little doubt that their elder son, Private B Membury, Civil Service Rifles, reported missing on March 22nd is now dead. A letter from the Red Cross Enquiry Department says that information given by a comrade is to the effect that he saw Private B Membury instantaneously killed by a machine gun bullet near Croisalles. Private Membury who was 37 years of age, was before joining up, engaged as a buyer for Messrs. Selfridges’, London." 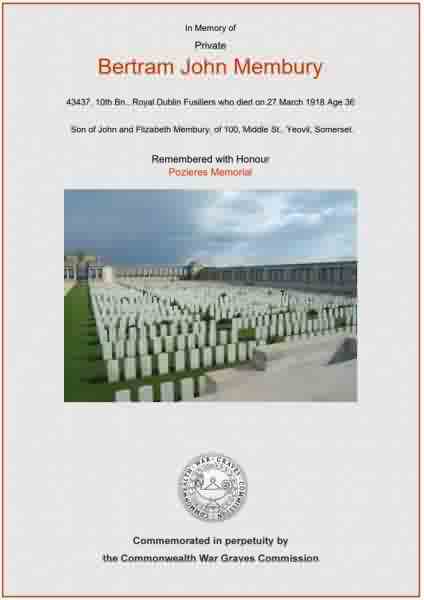 Bert Membury is remembered on Panel 79 and 80 Pozieres Memorial, Somme, France, and his name is recorded on the Yeovil War Memorial in the Borough. The Commonwealth War Graves Commission certificate in memory of Bert Membury.